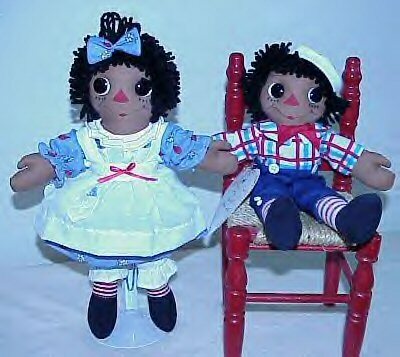 his widow Myrtle Gruelle authorized the Georgene Novelties, Inc to begin producing the Raggedy Ann & Andy dolls in 1938.
with various family members, also being involved. 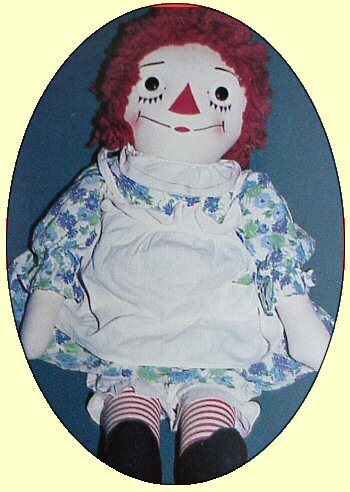 which was used in some of the doll markings. 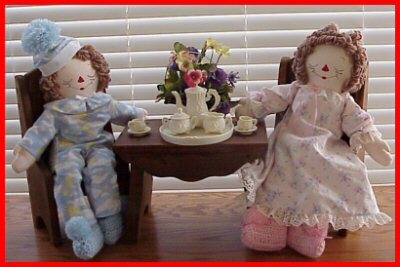 Horsman company and several other doll artists. 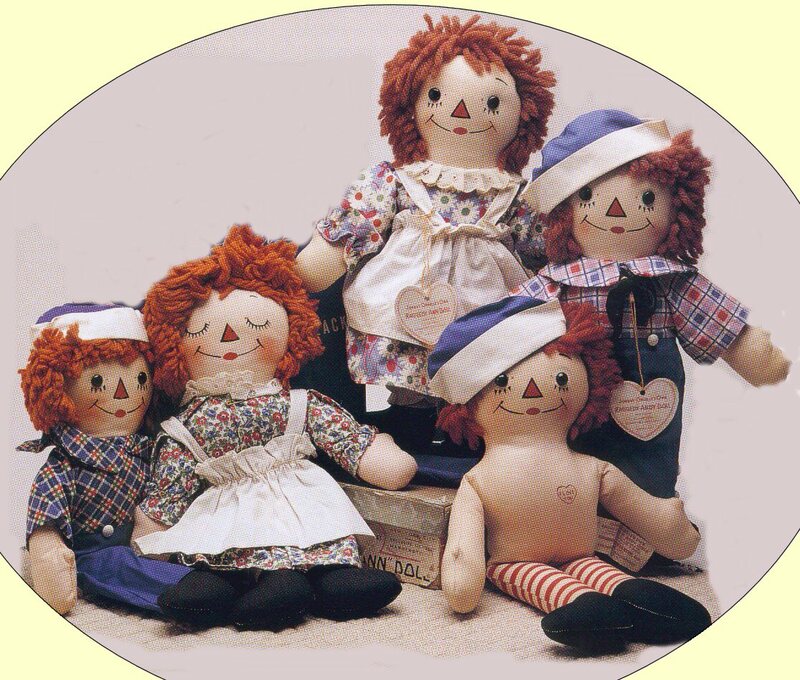 The Georgene Raggedies were mass-produced in all sizes. Three different designs of the "I Love You" shape of the heart printed on the bodies. 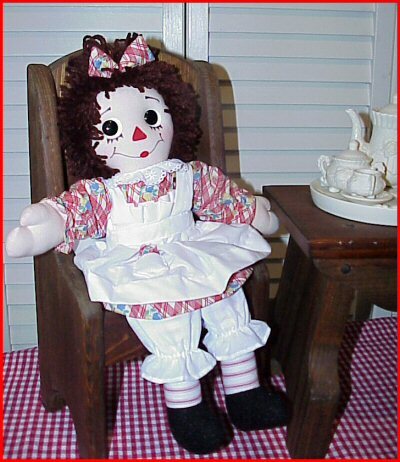 Tags identifying the dolls as "Georgene" are found sewn into the left side seam. There appear to be at least four different tags/labels. 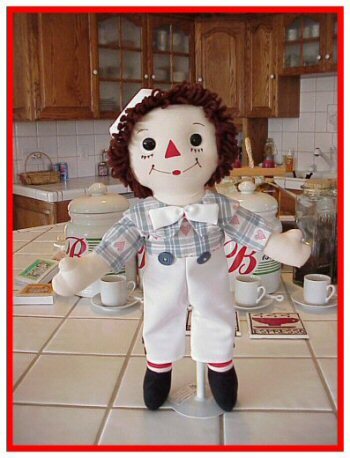 Georgene Novelties, Inc. were the first to use tin, and then button, eyes. and six different nose designs. seem to capture the magic of Johnny Gruelle's illustrations. 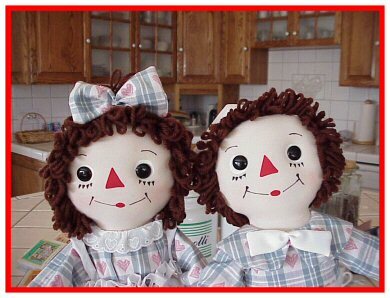 First came the Black Outlined Nose Raggedy Ann & Andy dolls. 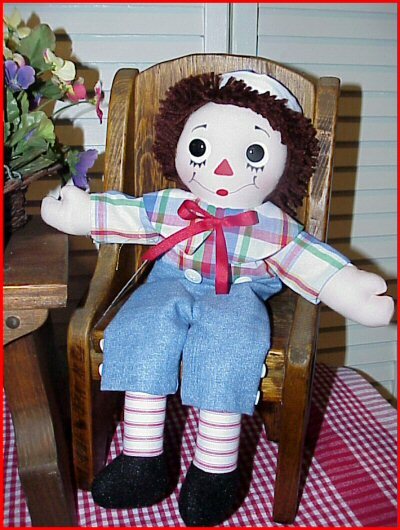 Georgene produced these dolls from 1938 to the early 1940's. 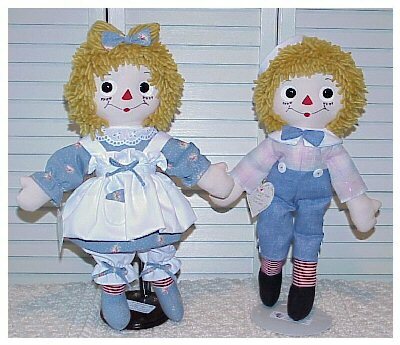 The dolls came in a variety of sizes (19", 23", 31"). 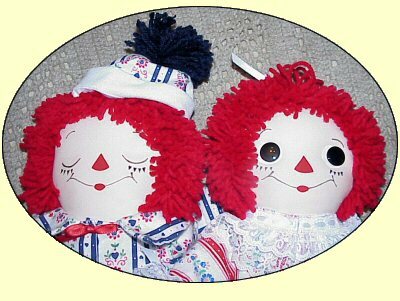 Their rather long red noses were out-lined in black and their wigs were made of wool yarn. Their outfits closed only with a small gold safety pin. 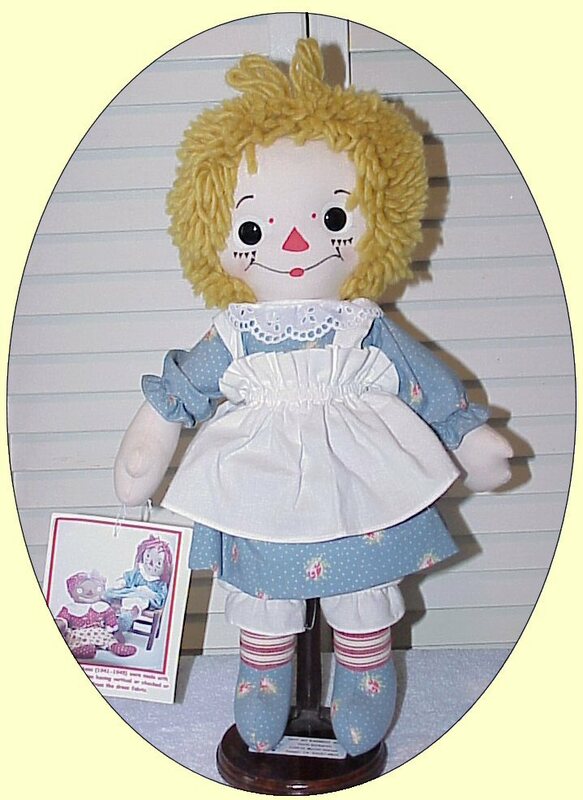 Andys pants and Anns apron had metal buttons . 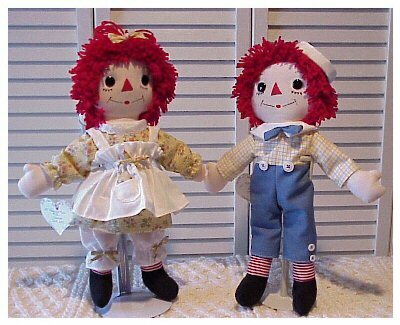 Both Ann and Andy looked identical, with black shoe-button eyes, and their bodies were stuffed through a seam up the back. Next came the Transition Ann and Andy, which are much harder to find. 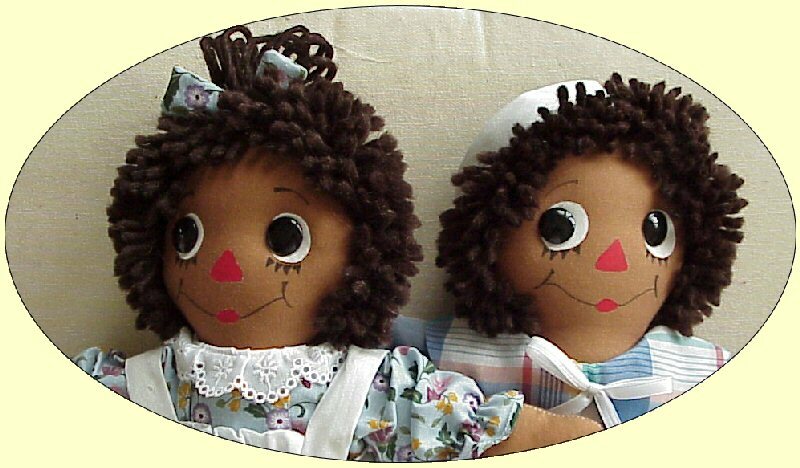 They were very similar to the earlier dolls except that the noses were no longer outlined. Andy was given a white collar and buttons were added to his shirt. 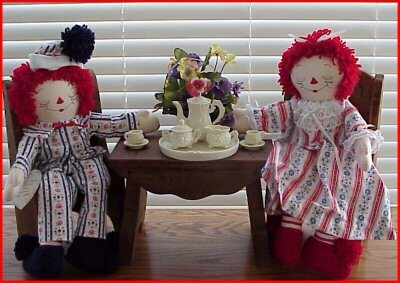 Their wigs were now made of cotton rather than wool. 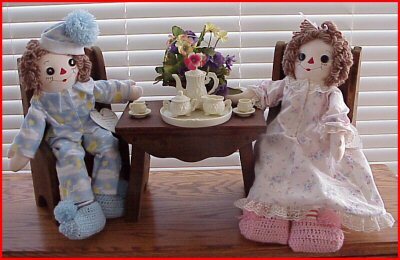 13" Awake Asleep Ann and Andy dolls. and the other side is asleep. 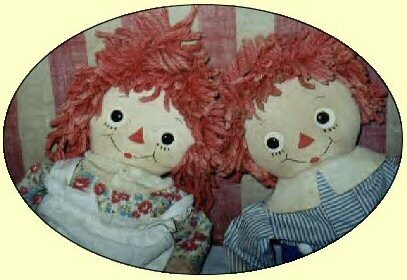 Their noses were outlined in black until 1944. They are considered to be choice pieces by Collectors as well. 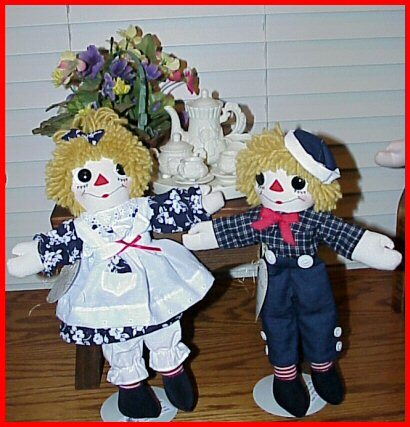 Wartime Ann and Andy dolls were produced from 1943-1946. They were still offered in the same sizes, (19", 23", 31") with no outline on nose. However, due to wartime fabric shortages, a variety of prints were used, not only for their clothing, but for their legs and feet as well. 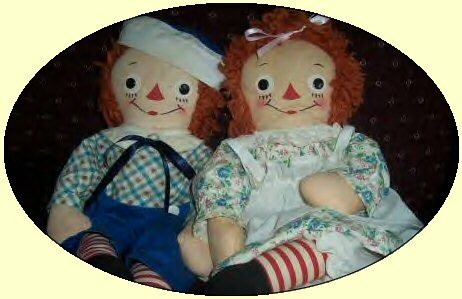 Both Ann and Andy had identical faces. 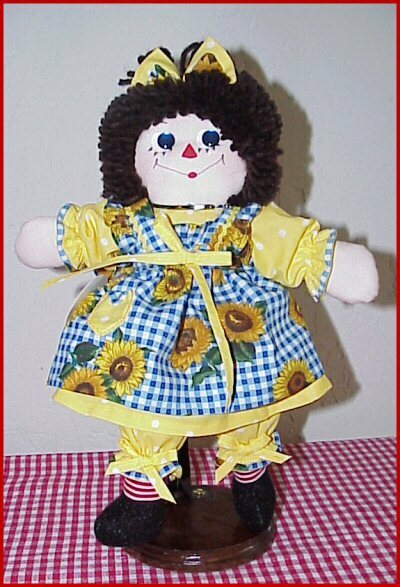 Georgene Novelties added 15" dolls in 1946 through 1950, to their current sizes of 19", 23", 31". 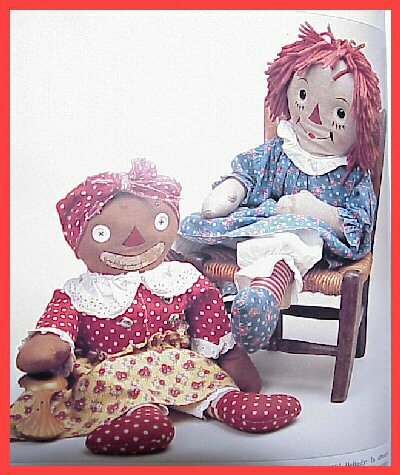 Postwar/Silsby Ann and Andy Silsby was printed on some of the dolls tags and their boxes. 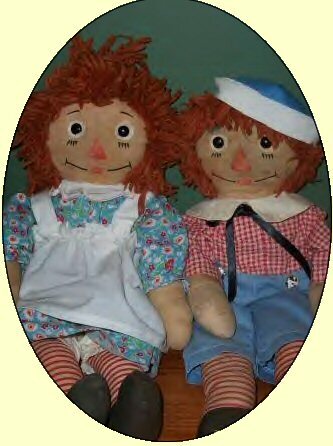 Ann & Andy dolls had identical faces. 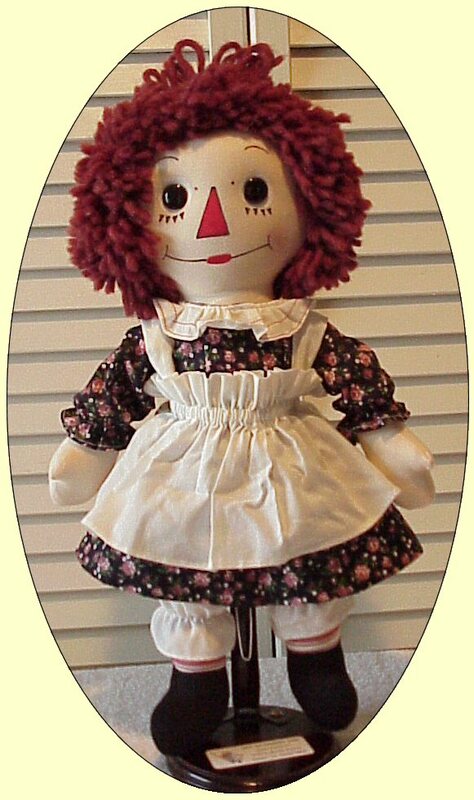 The "Silsby" Raggedies are also identified by their very curvacious smile. 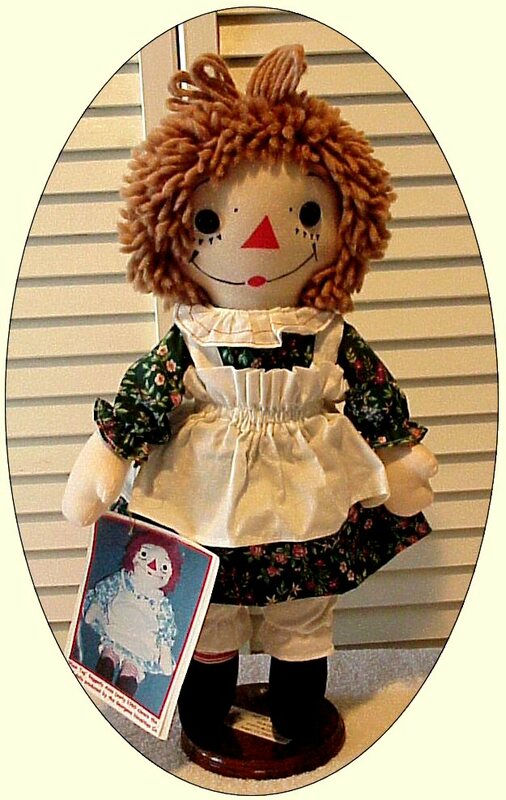 Most but not all dolls made during this period had "Silsby" tags. were produced from 1950 through the early 1960's. 15", 19", 23", 31", 48", 50"& 52". 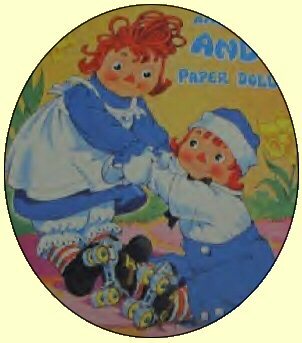 Ann and Andy now had metal eyes, except for larger dolls who had plastic eyes. 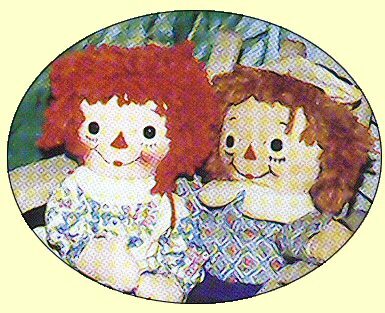 There was a variety of facial designs, however, Ann & Andy had identical facial designs. Their wigs were now glued to head rather than being sewn on. 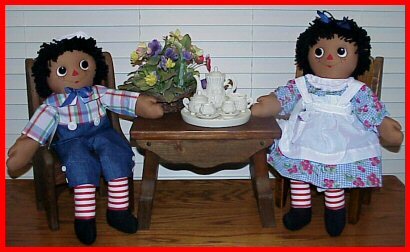 Georgene Novelties produced 19", 23", 31" Ann and Andy dolls.
" 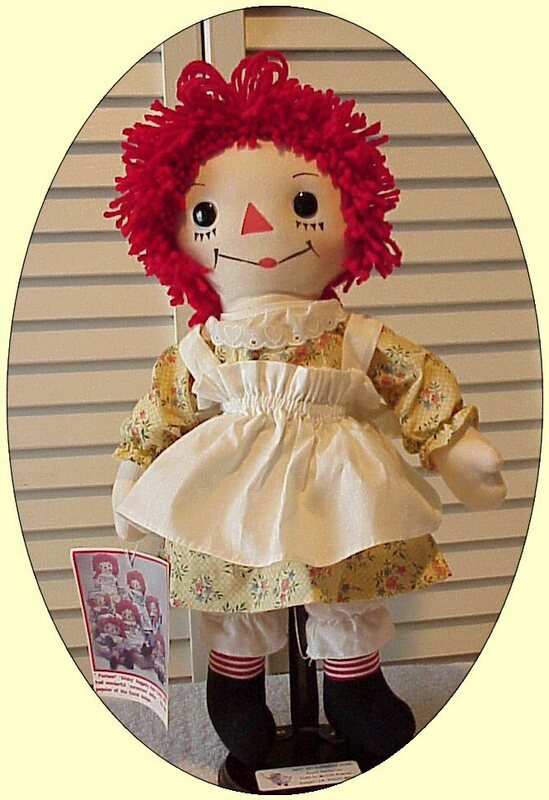 Finale " Raggedy Anns & Andys. 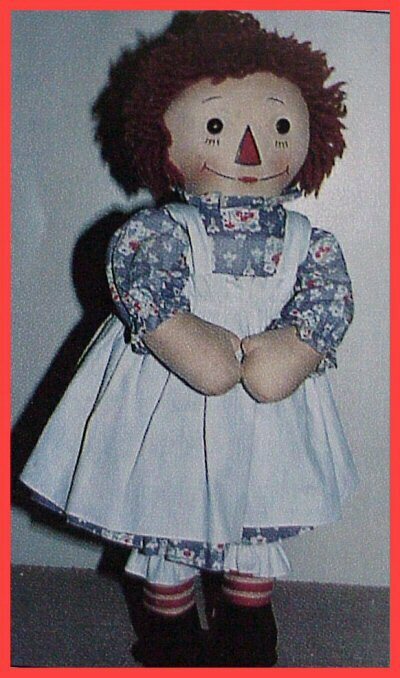 Since Georgene's contract was ending, it is thought that the last dolls were given plain tags rather than the previously printed tags. "Wright," "Kirget," "Torcia," "Lapenta", "Tortuga", and "Semone". 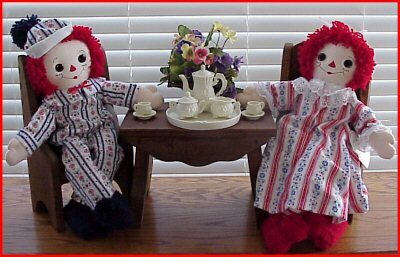 that were in charge of finishing off the last of the dolls, once the contract ended. 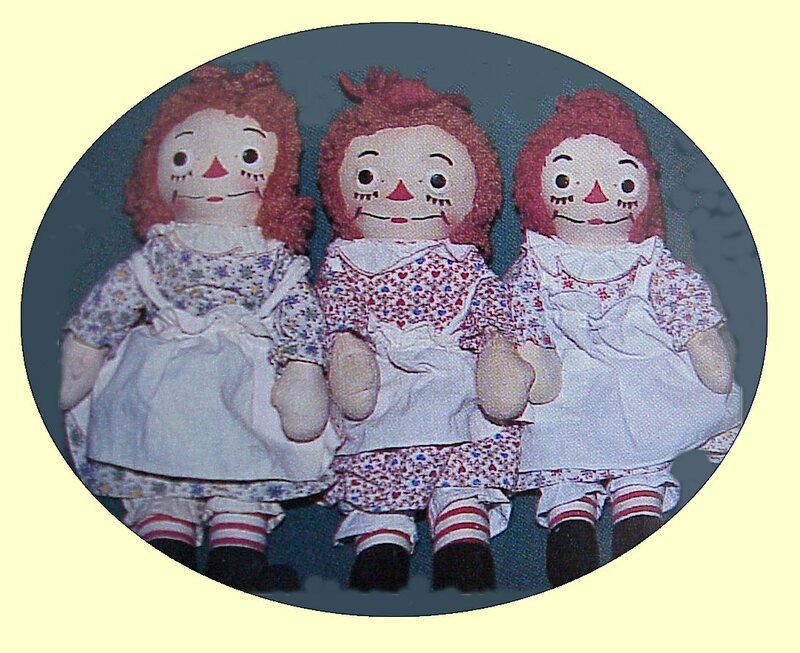 Facial designs varied on these particular dolls, however, they are easily identifiable as Georgenes by Collectors. 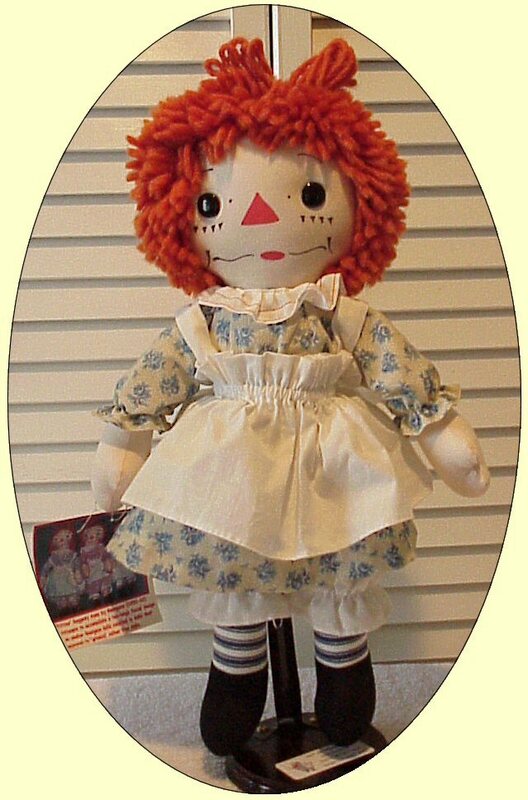 Some of the same dress fabrics used on these finale Georgenes, were also found on several of the early Knickerbocker "Joy of Toy" Anns with New York body tags. 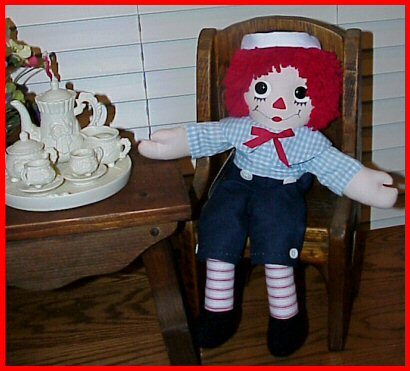 This was prior to Knickerbocker's mass production overseas. Visit my FACES page for a close-up view of all the faces I offer. 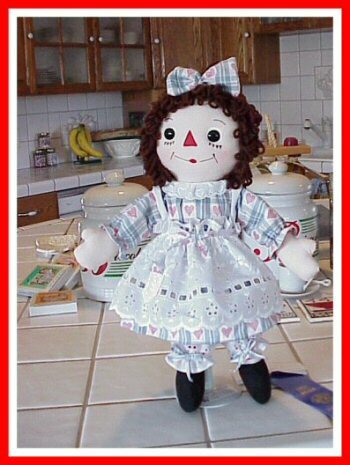 To learn more about the order in which the Georgene Raggedy dolls were produced. 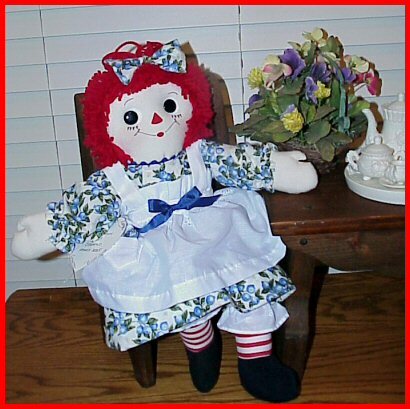 Here are a few of MY OWN re-creations of "Georgene Raggedy Anns & Andys"